Geek is lost and needs to get back home to Gweldar in time for Christmas. Find the little picture of him on the Competition Banner below and help him to find his way home. There will be 1 Lucky Prize Winner! 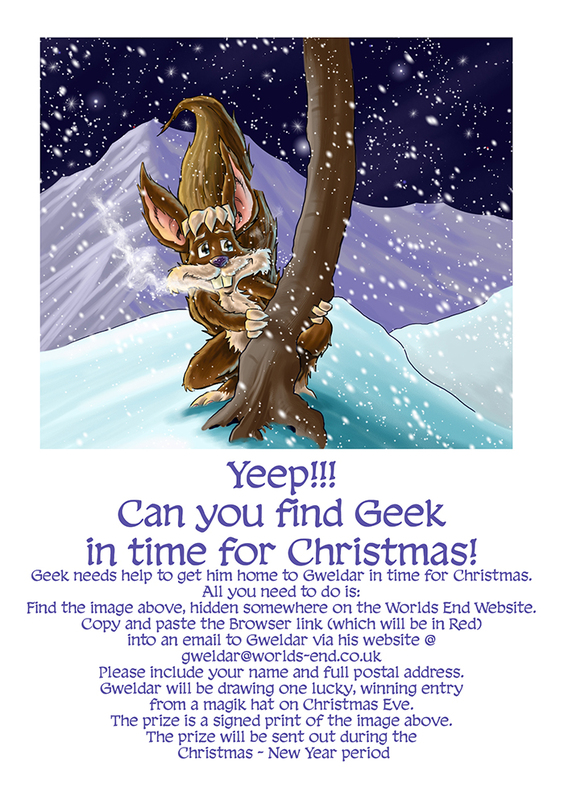 The Prize for the winner is a Full Size Print of the Picture of Geek in the Snow and you never know, as it is Christmas we may through in something else to help share a little magik during this festive period. Once you find his whereabouts just tell us which page you found him on – you can copy and paste the browser page information into your email or carefully copy it into your letter so that we know you have found the right web page. Or if you prefer you can send us a screen-grab of the page in question. THE DEADLINE IS THURSDAY 24TH DECEMBER at 17:00pm GMT (That's 5 o'clock in the afternoon for us kids). All Names with the correct answer will be placed in a magik hat and will be drawn out by Gweldar himself on Christmas Eve.